While it is recommended you get your roof inspected once a year, if you think it has been damaged by a storm, it’s important you hire a roofing specialist to take a look as soon as possible. If left unchecked, damage can be exacerbated, resulting in expensive repairs or replacement. 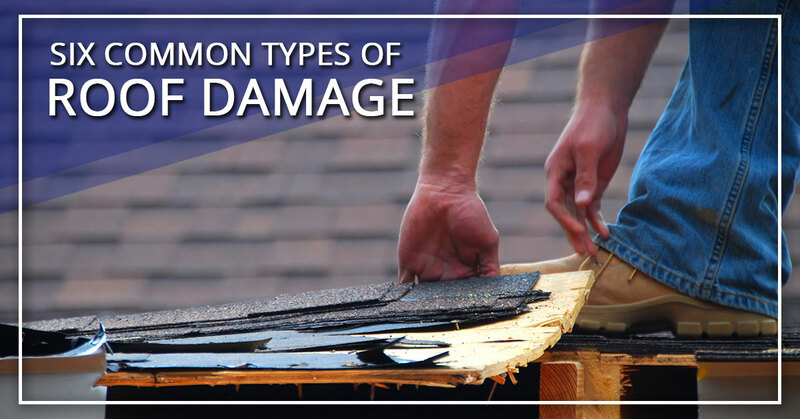 With that in mind, we’ve gathered the six most common types of roof damage we typically see. If you suspect your roof has been damaged, call us at SAFG Inc as soon as you can. If you’re dealing with a leaky roof, it’s a sure sign that your flashing has likely cracked. The flashing is thin pieces of metal underneath your shingles and on your joints, installed there to create a protective barrier against water. If the flashing has not been fastened properly, your roof will not be water resistant. Over time, the tar that is used to seal the flashing can corrode, which will leave your roof vulnerable to cracks and leaks. If the flashing was poorly installed, it can also result in blow-offs and tenting. That is caused by seams opening up, which allows wind to get underneath the shingles. If wind damage is left unchecked, it can get much worse. This can become very expensive, costing a homeowner up to $10,000 in roofing repair and maintenance. Storm damage can cause severe leaks. This can be a result of heavy rainfall, hail, or an accumulation of snow. Homes in areas that receive heavy snowfall must be designed to support the weight of the snow and sloped properly so the snow does not sit on the roof for extended periods of time. If large amounts of snow melts on the roof, it can cause serious damage. This moisture can also leave your home much more vulnerable to mold infestation. If a roof is not regularly and properly maintained, small problems like ponding water, unfilled pitch pockets, and other issues can grow into much larger, much more costly problems. Not only will it help you minimize damage, it will also extend the life of your roof, reduce expenses, and increase the odds that your insurance will cover any damage that could occur in the future. Most insurance companies will not cover issues that have come as a result of a worn-out roof or lack of maintenance. Punctures and post-installation damage might be the most annoying forms of roof damage. Even a small puncture can compromise the integrity of both the existing roof and any future additions. They can even void your warranty. That is why it is incredibly important to hire a roofing contractor who knows how to properly walk and work on an existing roof. This is yet another reason why it is not recommended for homeowners to attempt roofing repairs on their own. It is safer to hire a professional to inspect and perform any repairs, at the very least to maintain the manufacturer’s warranty. A failing roof can be identified by many symptoms. Cracked caulk, rust spots, buckling shingles, and excessive wear near chimneys and other features are all signs of a roof that is failing. However, one of the major signs that your roof is failing is blistering shingles. This can be caused by many different factors, including inadequate attachments, poor inter-ply integrity, improper torching, air and moisture being trapped, along with other causes. While small blisters may not require immediate attention, large blisters need to be corrected as quickly as possible so as to prevent premature aging and other consequences. Proper maintenance and repair can extend the lifespan of your roof, prevent damage to the rest of your home, and reduce costs with insurance and warranties. If you have noticed damage to your roof, it is imperative you do not attempt to repair it on your own. Not only will you not save money, you will void your warranty and put yourself in danger. Instead, call the roofing experts at SAFG Inc. Located here in Fairburn, we are the roofing gurus of suburban Atlanta. So whether you need to repair weather damage, complete an annual inspection, or do a full roof replacement, SAFG Inc can help you. Call us today!